We have all seen cartograms in the past: the last election showed us the true voting power of each state relative to its respective electoral college representation. But the web has opened access to even more of these distorted maps, as more and more reliable statistics have informed their creations. Take for example the cartogram of nuclear power plants in the USA (click on the "Resize" arrow above). There are so many other choices from around the world and more are added on a regular basis. From the poignant ("Iraq War Deaths") to the absurd ("Bigfoot Sightings"), each cartogram can be shared as an animation (see above) or a static image (see right). 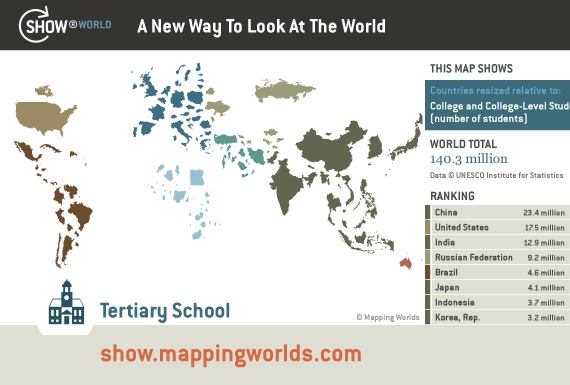 All of the featured maps are taken from SHOW: A New Way to Look at the World.